Lagrein is an autochthone sort of grape of Alto Adige which gives this red-wine its name. Sometimes you can find some rosé out of Lagrein, too. 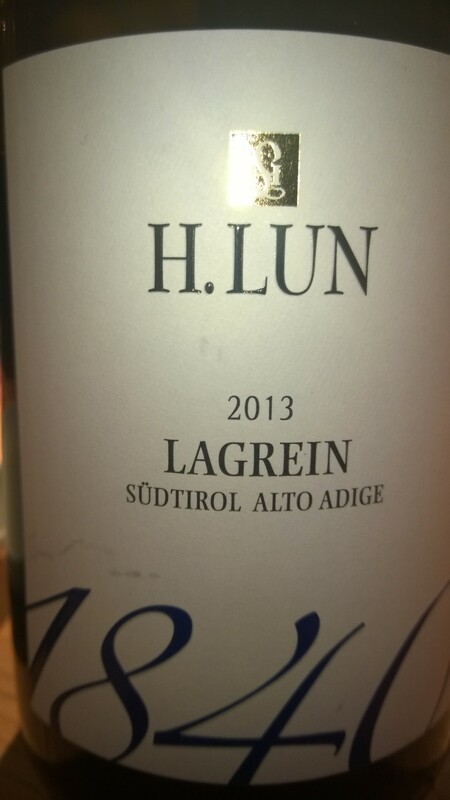 Although I do not know too much about the vinery H. Lun but it seems this belongs since not too long time to another winemaker of Alto Adige: Cantina Girlan. However, as I don’t like to spread out wrong information I will focus only on this wine. I know the Lagrein of H. Lun pretty long. It was introduced to me more than ten years ago the first time by Heide Pellmann who ran a small wine-store in Berlin Prenzlauer Berg called “Nix wie Wein”. She always has some nice but really also affordable wines which was perhaps this sympathetic lady’s biggest talent. In general a Lagrein cannot be some top wine due to the grape and its rather simple quality. At least I never made such an experience. However a Lagrein has its typical and individual character. I like it because it really differs from a lot of other tasting experiences and due its rather modest approach it can be in certain moments particularly pleasant. This wine taste like a basket of blueberries – not too sweet just freshly picked – so not only sweet but also a bit fresh and sour. For me this taste is also connected to the area where the wine is from: lower valleys of southern Tyrolean Alps, so the terrain is more stony and mineral probably than somewhere else. This wine is really delicate, lusty but also light and relaxing. It is a kind of “Brotzeit” wine as I would serve it a bit colder than usual red-wine. If I am in the mood to eat just German farmers bread with sausages, ham or cheese, some radish and sour vegetables – perhaps some caraway appears in the bread – this wine fits very well. You could call it a house wine. Basic, truthful and uncomplicated. The webpage of the vinery is helpless: http://www.lun.it/ as no information are available. Since there was a change of ownership of the winestore of “Nix wie Wein” I don’t know if they kept this vinery. At least at one of the biggest but also really extremely rich selected variety on-line wine shops offers the wine: http://www.c-und-d.de/.